A lot of men go end up losing hair and going bald and 20% of men end up going bald before the age of 30. Sadly, I’m in that 20% :(. I started noticing I was losing hair around 2 or 3 years ago. I basically had no hair on my crown and I got really worried and upset but, I didn’t do anything about it. It then started getting worse and worse. I’ve been using Rogaine since November last year but it hasn’t really worked and if anything, I’ve lost even more hair! My hairline has pushed even further back at the sides and the small bald spot I had at the crown of my head has got even bigger and moved even closer to my hairline. For someone who has depression, type 1 diabetes and memory problems, this is just icing on the cake. I really just want to die. Everyday I wake, 2 or 3 times throughout the day and before I go to bed, I think about ending my life. As my hair has been getting worse, I’ve thought about it more and more and it’s stressing me out so much. I dropped out of university so I could get well and go back but going bald is just making me more depressed. I don’t know if stressing about it is making me go bald quicker or if it’s a combination of things such as my poor diet and other health problems. I just know that it’s getting to the point where I need to shave all my hair off and it terrifies me. As I’ve mentioned a million times, I can’t even get a girlfriend with hair! So what chances do I stand without hair! In my head, practically 0! All I want to do is cry and overdose on insulin but I can’t :(. I don’t know what to do. I went to see a consultant or hair specialist about going bald. We talked about having a hair transplant but it costs so much money! It’s roughly between £6,000 to £12,000 and as I currently only have £50 in my bank account, I’m quite a way off. The man I spoke to was quite nice as he said my hair was very healthy and getting a transplant now would be way to early. He said I probably won’t need one until I’m 30 but to take photos at the end of every month so I can see how fast my hair is going which I do, but it’s just making me more and more depressed. As well as that, I’m 27 so I’ve got less than 3 years! I’ve been buying Rogaine to try to help as well as other products such as Watermans Grow Me shampoo and conditioner. I’ve also bought Strand Maximizer to help. The problem with all of these is that it takes up a lot of time to use these products and when I’m going out, it either makes me late or stresses me out even more because I can’t get it done right or it takes up to much time. I’ve been doing a lot of research into going bald, with the main focus on being if women find bald men attractive. I’ve put a few links to the websites I’ve viewed below if you want to have a look. 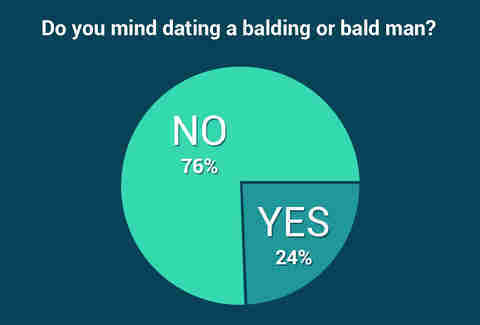 One of the websites had the pie chart below which are the results of asking 50 women if they mind dating a balding or bald man. 76% of which said no which has made me feel a lot better but still, that’s only 50 women and they don’t really go into too much detail about the study. Another link is to the student room which is asking students if they find bald men attractive. Most of them, saying no which makes me feel even worse as I am a student going back to university in September and I’ve never seen one bald guy there :(. Then I found a YouTube video of two women talking about bald guys being attractive and they said yes so :/. I’m just really scared at the moment because I can’t get a girlfriend with hair, so how am I supposed to get one without hair. I know it’s stupid but being in a relationship and having a girlfriend is so important to me and this just lowers my odds even more. I think I need to start looking after myself better and maybe that will help my hair. Stop eating crap/junk food, start doing some exercise, stop taking too much insulin and not dealing with my diabetes and to try to distress myself. I’m sure none of those things will stop or even slow down my hair loss but it might so it’s worth a shot. Even if it doesn’t, it might make me feel better :). My goal is to save money so I can eventually pay for a hair transplant but at the moment, I’m just trying my best to slow it down and cover it up. I know you’re meant to just shave your hair off as its way less attractive trying to cover it up but I’m’ just not ready to shave my head. I can’t :(. I just can’t do it yet. I’m not brave enough to take that step and I’d rather kill myself. Recently, the Life of Pi movie came into my head. I have the book but I’ve just not got round to reading it yet. I’ve seen the movie though and it’s now one of my favourite movies of all time! I only saw it because I wanted something in the background while I tried to complete some university work but I ended up being caught off guard by how amazing it was. It has to be one of the most captivating stories told and I highly recommend seeing the film. I bring the movie up because recently, me and the girl who ended things between us recently said she didn’t want to talk anymore. Basically, she’s become very unwell mentally and she’s had to drop out of university. She’s decided or the people who are treating her mental health decided, that using her phone is bringing down her mood and making her more unwell. So for the next 6 months/ year +, she won’t be using her phone anymore. We recently said goodbye to each other on Facetime , as she doesn’t know when she’ll speak to me again. She’s not getting rid of her phone completely which kind of made me think she just doesn’t want to speak to me anymore but she got annoyed by that so I was and am probably over thinking it. Anyway, not being able to talk to her anymore and having to say goodbye, made me think of the “Life of Pi” ending. I’m not sure if it’s the same as the book and I do plan on reading the book, but it’s a beautiful ending to the movie and I feel like it relates or I can relate to it. If you haven’t seen it, spoilers coming up but I’ve put a link to the two videos for the ending below. I do recommend watching the movie though before you watch the ending clips as I feel like it won’t be as moving without seeing the whole film. “I suppose in the end the whole of life becomes an act of letting go, but what always hurts the most, is not taking a moment to say goodbye”. This line resonates with me so much. With my first ever girlfriend, the one who hurt me so badly and who has been a huge part of me being so mentally unwell for a long time, we didn’t end on good times. Therefore, there was never a proper goodbye or any sort of goodbye. I never got any answers of why she ended things or what I did wrong. She just left me. She was horrible about me and to me. When Richard Parker in the movie leaves, it’s absolutely heartbreaking. “At the edge of the jungle, he stopped. I was certain he was going to look back at me. Flatten his ears to his head, growl. That he would bring our relationship to an end in someway… But he just stared ahead, into the jungle. And then Richard Parker my fierce companion, the terrible one who kept me alive…disappeared, forever from my life”.